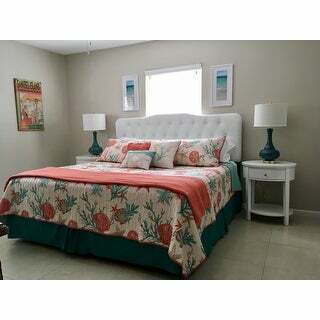 Perfect look for my river house, light coverlet for our Florida nights! For a coastal update to your space, the Pacific Grove Coverlet Set is perfect for you. 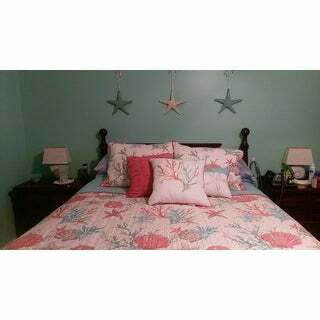 Printed on 210 thread count cotton sateen, the rich coral and teal colors play into the starfish and coral motifs for a textured look adding color to your space. Three decorative pillows use embroidery and fabric manipulation adding dimension to your top of bed. 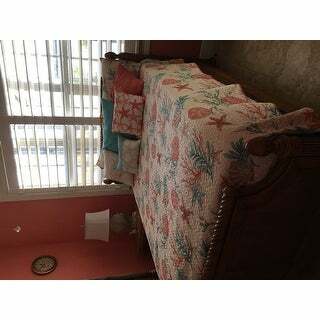 Set includes: One coverlet, two shams, three decorative pillows. Good buy for the price. Came with pillow shams and 2 throw pillows. I ordered a full/queen and it fit perfect on my full sized bed. Good weight for year round use in Florida. I bought this for my niece as a gift because she loved mine so much. The price is excellent. Do notice that it does not include the bed skirt. My comforter in this style does include the skirt. The quilt is well made. Colors are a lot brighter than they look in picture. Was expecting a softer color palette but now that I have it next to my black bedroom furniture it really pops. Happy with purchase. Although I haven't laundered it yet, the quality exceeded my expectations. It's not flimsy, lays on the bed well and is heavier than I expected. Background is off-white. Bought this to stage my house while it's on the market. Terrific colors. Fun yet sophisticated enough for a high end master bedroom. Would have given it 5 stars but the coverlet, in my view, is a few inches short on each side. It just covers the sides of the mattress. Great price....great quality....exactly what I expectd! Love it! Get lots of compliments on it. 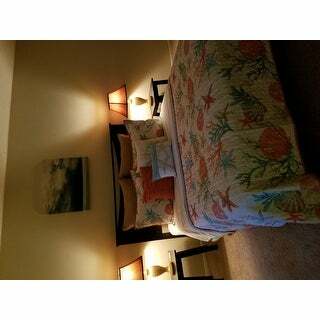 Put in our master bedroom in Florida. Really beautiful quilt set. Colors are very vibrant. This will look great in my beach condo. Planning to pair it with a set of teal lamps and a coral blanket at the foot of the bed. I was so pleased with my quilt and the colors. It matches perfectly with​ the wall color and my other accessories I have in our room. The quilt is thick enough with a lite blanket to keep my husband warm and light enough for me not to get to 🔥 from the hot flashes I get lol I really love the feel of it, perfect for a house in Myrtle Beach. It reminds me of the hand made quilt my Grandma made me over 50 yrs ago. This coverlet looks great on the bed, love all the throw pillows that come with it. Nice colors. Only issue is that it is a little smaller than expected for the KING size. Exactly what I was looking for, nice quality and to receive all those pieces is a great value! Purchased this for my daughter’s room because we were going with a coastal-theme. She loves it! 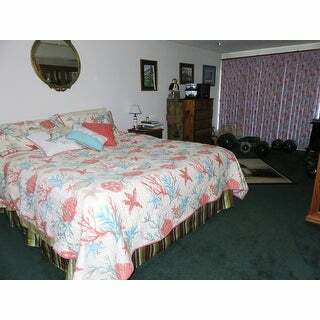 The colors are very pretty and the coverlet is just the right weight as she doesn’t like anything too heavy and warm. I purchased an additional accent pillow but this set does comes with three others. Very happy with this purchase! Gorgeous addition to my seaside retreat. This is such a fun coverlet. We have it at our cabin and get so many compliments. The colors just brighten up the bedroom. 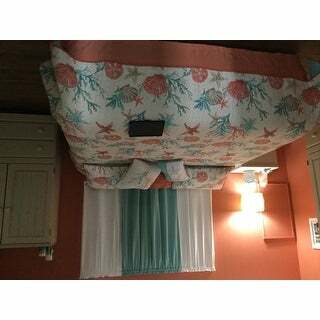 Everything, the color, the material, the look, everybody love my room with coral wall. I was hoping for a good quality set and this one is it! We have a queen platform bed and there is plenty of room on each side and at the end of the bed. I wanted something that I could wash and this is a good quality set. Love it!!!! great for the price. Good quality. Beautiful! Purchased for a friends and she loved it. Vibrant colors. If you love the seashore and beach decor you'll love this. Fit was excellent on queen bed. "What comes with the quilt?" The quilt is perfect for our bedroom. It comes with three small pillows and two shams. "What are the shipping dimensions and weight of this item?" "I see the measurements for the queen but should I go up to a king size? I do not use bed skirts due to the way my bed is made but want the coverlet to hang well on the sides." Yes -- I have a queen bed without a bed skirt & went up to king -- it covers well & I love it! I have a queen bed and also went up to the king quilt. I'm reallybgladnthatbi did. The material feels more like a light soft quilt. "Is this a slippery, silky type fabric ?" No, it is not slippery or silky. It is a soft cotton. "The description and photo show coral color but the specs say pink. If pink, would not be interested. Also, what is the background color, white, off-white, beige? Thank you." I just bought it and it is coral. Beautiful! Background color is a creamy off-white in my opinion. 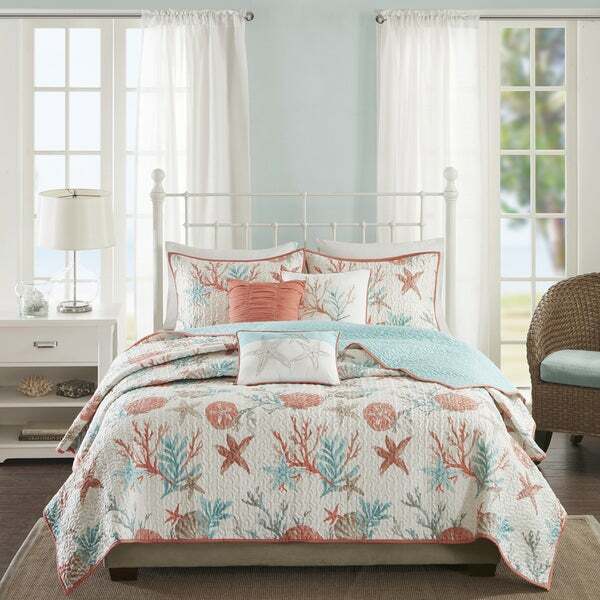 I have purchased other Madison Park quilt sets, and the quality of this brand is amazing.....and of course the "coastal" look sold me on this set.....anxiously waiting for it to arrive...hope to be as pleased with this one! !